Learn more about CleverHiker and founder Dave Collins. Our goal is to make backpacking easier, safer, and more enjoyable for everyone. We hope to inspire travel and increase conservation of our cherished wild spaces through skill-based tutorials, comprehensive trip guides, and in-depth gear reviews. Our website encourages hikers to experience nature at it’s finest, and that mission comes with a great responsibility. We emphasize low-impact travel and Leave No Trace backpacking methods in all of our resources. We also encourage wilderness conservation donations and trail maintenance volunteer opportunities. In addition, one of CleverHiker’s main focuses this year will be expanding our partnerships and donation efforts with environmental conservation groups. We have an immense respect for mother nature. We believe all of us need to be stewards of the natural world to protect our wilderness for generations to come. CleverHiker was created in 2012 by outdoor enthusiast Dave Collins and has grown in scope every year since. While preparing to thru-hike the Pacific Crest Trail, Dave wanted to increase his knowledge of all things backpacking. He couldn’t quite find the detailed information he was looking for, and so the idea for CleverHiker was born. CleverHiker started with two tutorial video series projects: Lightweight Backpacking Gear Basics and Essential Backpacking Skills. Since then, CleverHiker has grown into a comprehensive online backpacking resource with three pillars of focus: skill-based tutorials, comprehensive trip guides, and in-depth gear reviews. Dave is the founder & CEO of CleverHiker and he oversees day-to-day operations. He grew up in Michigan in a outdoorsy family and spent much of his childhood on the trail while earning his way to Eagle Scout. Dave has been fortunate enough to travel the world, trekking on every continent and experience some of the most pristine wilderness areas on our planet. After graduating from the University of Michigan with a degree in economics, Dave spent a few years honing his skills in various corporate positions, but he didn’t find much passion or purpose there. In 2010 Dave decided to quit his job and embark on a life-changing adventure: thru-hiking the Pacific Crest Trail. Post PCT, with a renewed outlook on life and a craving for more adventure, the idea of CleverHiker was born. When Dave isn’t hiking in the mountains, you can find him enjoying the company of friends and family, surfing the coast, playing rec sports of all kinds, traveling the globe in search of new experiences, and getting active outside in pretty much any way possible. Annie is Dave’s partner in life and all things CleverHiker. She helps with content creation, photography, and day-to-day operations. Growing up in Wisconsin, Annie’s family always valued spending time outdoors, especially at her cabin in Door County. 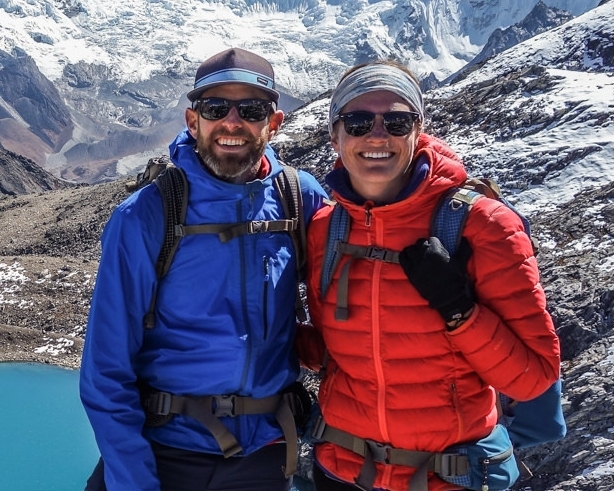 In 2010, Dave took Annie on her first backpacking trip to Goat Rocks Wilderness in Washington and it was there that she was introduced to the second love of her life - backpacking. Since then she’s endlessly explored this big beautiful world - from the Himalayas to the Andes to Antarctica - but adventuring in the misty Pacific Northwest is home. She’s a gear nerd at heart, always looking to maximize comfort and minimize weight. For ten years Annie was a teacher in Portland, Oregon. Ready to try something new and wanting to spend more time outdoors, Annie joined CleverHiker full time in 2017. With her enthusiasm for the outdoors and an insatiable appetite for adventure travel, you’ll usually find her planning the next epic CleverHiker trip. We hope you find our resources to be helpful, direct, and inspirational. Though we consider ourselves highly experienced backpacking experts, we also consider ourselves lifelong learners. So if you ever have feedback on how we can improve any of our resources, please know that your suggestions will be welcomed with open arms. The best way to stay connected is to sign up for our newsletter below. Also, follow us on social media and you'll never miss a trip guide, gear review, or tutorial video. Love what we’re doing? Then you'll love our monthly newsletter!